Philipse Manor Colonial updated in 2008 w all new windows, Central A/C. A charming modern home w tons of built-ins including original butlers pantry & large and spacious rooms. Huge unfinished basement with high ceilings can be finished. 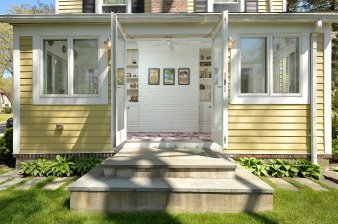 Back porch & new flagstone patio, plus pretty side patio w french doors from playroom. Deep level yard, Detached 2 car garage. Short Walk to Metro North, Philipse Manor Beach Club, Hudson River. 37 minutes express train to Grand Central.